Search Our Inventory / All Rugs / 8&apos; 8" x 11&apos; 1"
8&apos; 8" x 11&apos; 1"
(Connoisseur-Caliber) (�FALL/WINTER 2018-19 PRINT CATALOG", p. 18-19)This splendiferous piece, from the Town weaving tradition, is from a favorite style among our clients who appreciate living with expressive, yet formal artistry and exquisite craftsmanship. In constrast to the visual rigor applied to City or court carpets, this evocative carpet�s every blossom has an enrapturing individuality illumined by the great depth and richness of its shimmering palette. 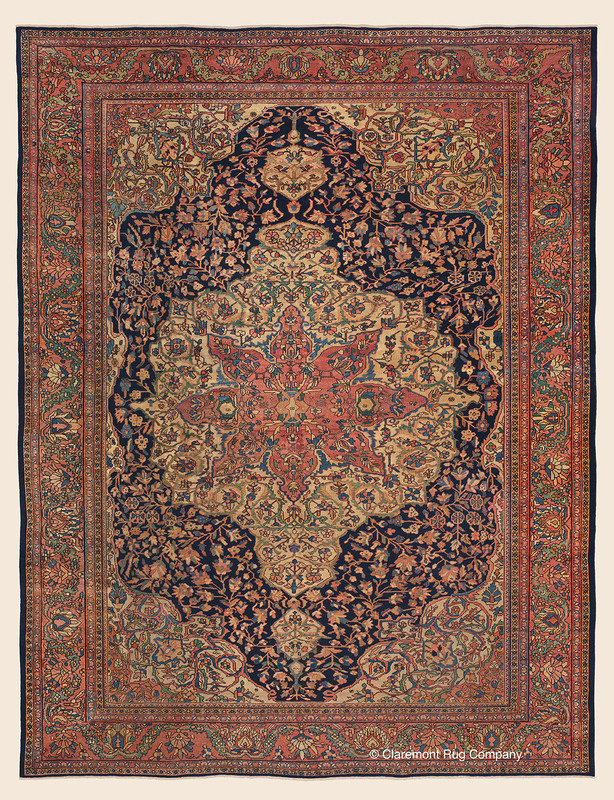 Known for their magnificent centerpieces, this Ferahan Sarouk reveals a captivating coral-hued blossom at the center of the carpet's grand medallion, stretching almost the length and width of the field. Happily it remains in very good condition after a century and a half.